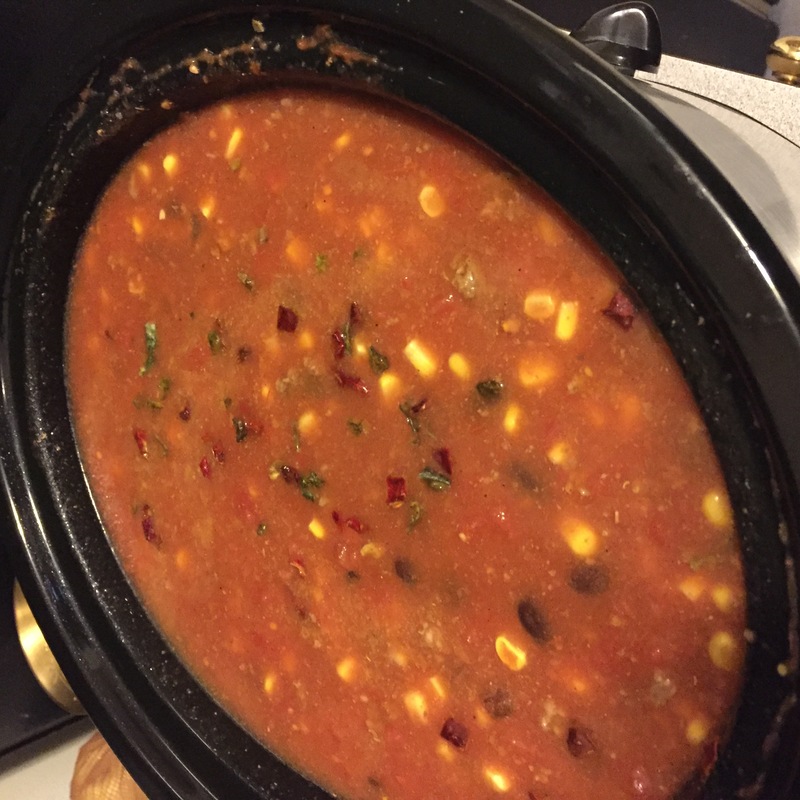 A Crock pot Taco soup is exactly what we needed last night after all the rain and the temperature only being about 50 degrees! It was perfect to warm us up coupled with some cheese and some tortilla chips! Such a heart soup that can keep you full and simply freezing it so you can enjoy it for a while too! Turn your crock pot on high and spray with non stick spray. Place you ground beef in a pan and cook it down into small (as small as you can) chunks like you would for tacos. Then put your taco seasoning and ranch seasoning on and stir around. Take off burner. 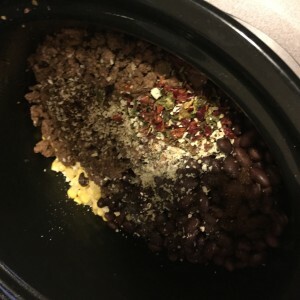 Place meat in the bottom of the crock pot and then add your corn, onions, peppers, beans, tomatoes(both diced and crushed) and spices.Then add your water (i just used my crushed tomato can and filled it up). If you are going to let it cook for more than 6 hours I would set it down to low however, if you put it together about 4-6 hours before serving you can leave it on high. Serve hot with some crackers, tortilla chips and cheese! 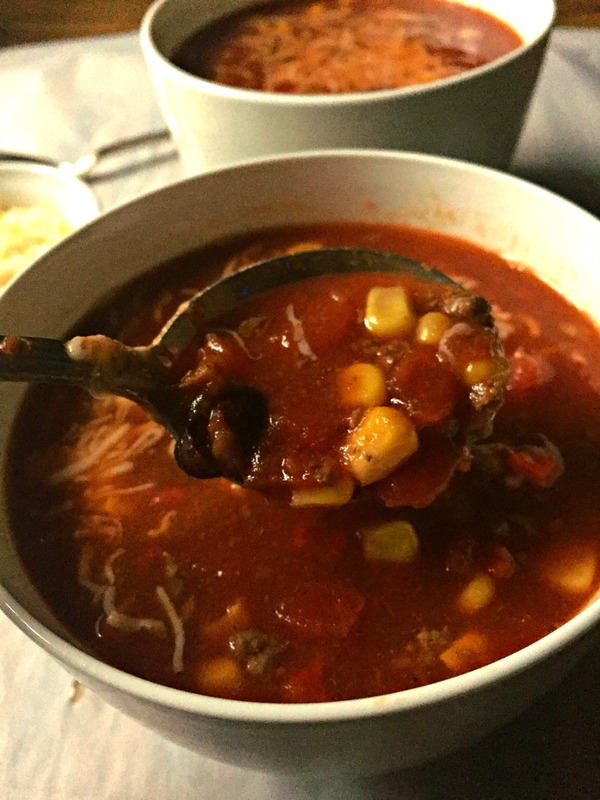 An easy and tasty soup that can be cooking all day and you can come home to a good smelling house and a great dinner! Oh so yummy! 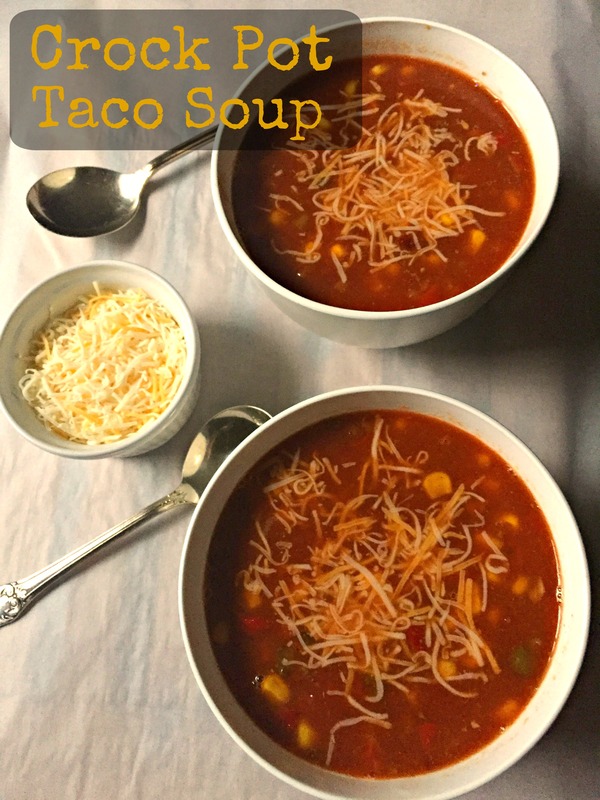 Crock Pot Taco Soup was dinner last night and lunch today! I just simply put it in the fridge in my crock and took it out and set it on high for lunch so that it would be steaming and ready for us to eat! I added another can of crushed tomatoes and a little bit more water just so it was thinner for us because it did thicken up a little bit from the ranch seasoning. Such a great lunch (especially with some cheddar crackers like goldfish!). I did just get done with lunch so don’t hate me for telling you just exactly how yummy it was! Don’t forget to follw me on Twitter (@not2shabbygabby), Pinterest (@not2shabbygabby), Instagram (@notshabbygabby) and Facebook to stay up to date on all posts and recipes! Mmmm! This sounds sooo good. 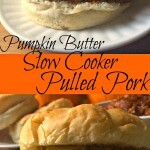 I’ve been using my crockpot a lot lately, especially for soups. This one sounds really hearty! Thanks for sharing it with the Wednesday Showcase. Thank you Jenna! 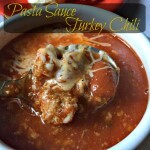 It is a great soup in the cooler season! you say 3 tsp of taco seasoning but in parenthesis you say 2 packets….which one is it? 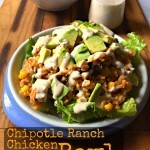 We love taco flavored dishes so this sounds like a good one to give a try this fall! Thank you! 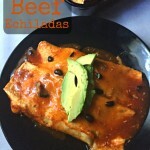 We love a little kick in our dinners and this really hit the spot! Who can resist these delectable ingredients! 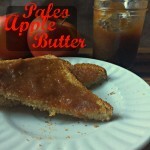 Thank you for sharing this yummy recipe on the Healthy Living Link Party. I’m pinning it! Thank you Deb! 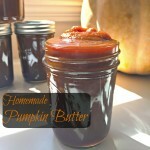 It is a great recipe for cool busy days! You had me with the title. Crock Pot. Soup. Taco. Hello!!! I’m yours! And it looks delicious. It’s gotten colder here too, there was frost on the car this morning, had to warm the car! LOL But I still have a few geraniums on the porch! Crazy. But I’ll take it!!! There has been frost on our cars a few mornings already! I am honestly ready for the little bit of snow we get and more soups!